I’m discovering I can take pictures or write, but not both at the same time. My brain has lost all ability to string words together to create meaning, so I’ve been taking lots of pictures…and settling down into family life. There are kindness projects in the works and new learning that is spawning some big plans I can’t wait to share but for now it’s been a week of cats, sticking my foot in my mouth and family friendship. The tiny cat strolled up to our door on Monday night. The kids were out of their minds and played with him for hours. I suddenly turned into my mother or father yelling, “Absolutely NOT!” out the window. “I am Luce, I am nervous no one will take care of this cat, like no one takes care of the dog.” I replied. “We can get rid of the dog mom!” she said. Like this will solve my problem. The cat disappeared as quickly as he came leaving everyone devastated, until Friday. It was a sign, he was back, even I was warming up to him. He was a nice little cat. The kids named him Silver…and 42 minutes later our new neighbor came over. “oh.” was the collective reply. This article got me into a heap of trouble this week. It was written pretty impulsively, completely off the cuff yet kind of honest. I mentioned a question I had in my head (when we were considering our school options years ago) about homeschool kids being a little weird, but wondering if it was a “good” weird. Oh, to try to get my foot out of my mouth on that one was near impossible. Who wants to be called weird, and even worse who wants their kid to be called weird?!!! I know, I know. The stereotype was perpetuated, feelings hurt, it was a disaster. No sooner than I hit the send button on my e-mail, did my life instantly become a homeschool experiment. The universe is funny that way. The truth is lately we have been considering the homeschool option more than ever, my son Josiah is practically begging. I think my own fear of if-we-do-this-will-it-make-my-kid-weird feelings are in overdrive. Throw a little ignorance in there and you have a recipe for disaster. Please forgive me homeschoolers and please feel free to share your own thoughts and fears about homeschool before you took the plunge in the comments. I don’t know or think we will do it for 322 other reasons but the whole drama ignited a little fire in me to be present with my kids in a deeper and more meaningful way. Let’s just say we are gently exploring…barely, maybe. Josiah, Jack and I were all up at the crack of dawn on Sunday morning when I decided to make pancakes. “Can I help?” Jack said. “Yes! We are doing pretend homeschool, on the weekends, but not, really.” I answered. They both cheered and we went on to make pancakes and let the math, science and measuring goodness unfold. There was SO much pancake pride floating around, you could feel it in the air…and smell it. Surprisingly, they are MUCH better at making them than I am, especially after I explained that there is a pancake dud in every batch (3 or 4 in my case). Every once in a while, Jorge will do something so incredibly sweet and endearing that I’m literally speechless and this covers any assholery the man has ever committed. It is usually delivered in a quiet, round-a-bout way. This week he came home and up the stairs and laid 2 small bracelets on the bed. It was a brightly colored bracelet like the kind we made in the 6th grade. “What is this?” I said as he tied the neon red, pink and purple bracelet around my wrist. I instantly was returned to puppy love and girlhood. I went downstairs to get the kids ready to go out and realized he gave one to everyone in the family. I’m telling you, family friendship is where it’s at people…wonder twin powers activate. OH MY LOVELINESS to the bracelets, the friendship, the kitty love (the bottoms-up pic!). I think everybody brings their own baggage/defensiveness/idealism to the school conversation, and it can make a rational discussion nearly impossible, sometimes. Sure, maybe “weird” wasn’t the best choice of words, but those responding could have given you the benefit of the doubt, especially since many of them have probably faced the same fear at some point in their parenting journey. The environment each of us exists in does shape us or not shape us in certain ways. Kids in traditional schools, progressive schools, or in various homeschooling environments have different daily realities and it DOES make a difference! Let’s all give each other the benefit of the doubt and talk honestly about what those differences can be and what it might mean for our families and our children’s futures – for better, worse, and everything in between. PS: writing isn’t always about volume! I think you have a knack for short, poignant thoughts that accompany your photos. Wish I had that skill! So here I am going into our third year of homeschooling. Every sterotype I ever had about homeschooling was wrong. Just flat wrong. Sure there are those who homeschool their children to shelter them from the world and make sure the children follow them in their ideologies, but you will never see them out in the world. If you haven’t read it yet…feel free to go and read a bit more about how we fell into it all http://thecreativemama.com/somewhere-between-never-say-never-and-are-you-nuts/ and I would love to have you guys join us on some of our adventures this summer! We hangout with other kids just about everyday of the week. The big joke in the homeschooling community is we mom’s sure do wish our kids weren’t so darn “un-socialized” 😉 We do 3X more now than when they were in traditional school. Knowing you a wee bit I know you didn’t mean “weird” in a bad way which was why I was surprised that you used that word. I really felt like your article deserved a thoughtful response and hope it was received in the spirit in which it was offered. Thank you for opening up the discussion and sharing your honest feelings. I truly believe that the “education” conversation can exist without pitting one method against another and the comment section ( I *think* I read them all) was an interesting exercise in that. You are delightful and I admire your ability to put it out there with the parenting articles and blog. i am thinking of homeschooling, too. then again, i think of doing a lot of things. like teaching myself to build a house from the ground up on a parcel of land out in the middle of nowhere where we grow all of our food, hunt for game, raise chickens and goats, make our own cheese, bread and soap, sew and knit our own clothes, have as many babies as god wants to give us, and sing songs around the piano by candlelight every night. but alas, since my husband is not a time traveler from the year 1820, and i want to remain married to said husband, i mostly keep those thoughts to myself hahaha! but more power to all ye homeschoolers–you have my admiration, and my envy. PS: I think what most people view as weird is really just kids who think with THEIR minds and not someone else’s. It’s odd to listen to a child’s ideas. Homeschooling allows children to be themselves without worry of peers and peer pressure to be something else. It creates more authentic children, and in a society where we don’t see REAL kids much anymore, I think we often THINK they are socially stunted etc, when in reality they are just being TRUE kids. You know what, there are plenty of homeschoolers who are “weird”. Everyone knows what you are talking about when you say that. I don’t think it should be some unmentionable concern – how else are we to address it? Anyway, as a homeschooling parent, I can assure you that while there are those “weird” homeschoolers, they are well outnumbered by those homeschoolers who don’t stand out. And, they are generally delightful people – the “good weird”. I think part of the reason they stand out, is because unlike their schooled counterparts with weird tendencies, their soul and spirit has not been crushed and pummeled into submission. They have an opportunity to flourish while homeschooling, never knowing that a classroom full of age-based peers would endlessly derride them. My point is, these kids would be weird whether they were homeschooled or not, just that they are spared the pain of schoolyard taunting, and thus, spared the inhibitions on their spirit. But you all probably see way more homeschoolers than you know, precisely because most of us don’t stand out. Though, I often wish my own kids were more like the stereotype, rather than the often loud, unruly bunch they can be! lol! That’s rather funny, I must have just automatically always thought of you as homeschoolers because I did a double take when you mentioned ‘considering the homeschool option’ :} Definitely a personal– no ‘one-size-fits-all’– decision. I get the weird bit. . . from both sides. It was a big concern for me when we started to seriously research homeschool as an educational option. My hubby was gung-ho. I had plenty of questions/fears. Amongst them the fact that I had only ever met really weird (to put it mildly) homeschoolers; had a few of them as neighborhood friends growing up. Fortunately dh had met some great homeschoolers. And– as with so many things– when I looked a little deeper than my limited experience the stereotypes just sort of started falling away. I realized the weird kids were a product of a dysfunctional family environment, they would have been weird if they were in public schools too. There is nothing magical about either option that makes kids perfect or perfectly strange. And there are as many approaches to homeschooling as there are families who homeschool. . . just like parenting. We started homeschool as a 1 year experiment, now we are approaching our 5th year. Love it for so many reasons I never anticipated. It has changed our family dynamic and the way we look at learning for sure- in positive ways. I think after awhile for us it has become more of an approach than a ‘place’; I’d still consider us homeschoolers if they kids chose public options. Maybe that’s why I thought of you as homeschoolers 🙂 Enjoy your exploration! BTW I love the picture of your little girl and the cat bending over! SO cute! Honestly, I do worry a little bit about bucking convention in homeschooling, and what that would mean for my kids. It’s one of the reasons we’re not doing it. Although, if there were pancakes on a regular basis, that might change my mind. 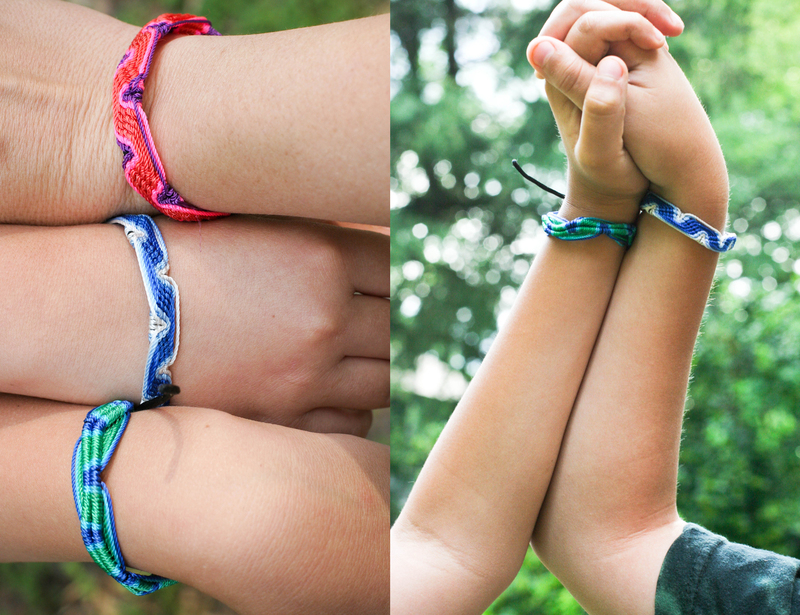 And the friendship bracelets? So amazing. Hey — waaaay to go!! I’m livin’ the best kind of weird with my kid you could ever imagine!! 🙂 Whatever your reason, whatever your season…..know that you’ll never find your way, you will MAKE it. It’s a huge exercise in letting go….of conventions, fear, anxiety, tests that make your kids ( and you ) cry…there’s a homeschooling genre that fits every family by the very eclectic nature of homeschooling itself! PS – I’m not offended, I’m honored!! Those who may be offended are waay to serious!